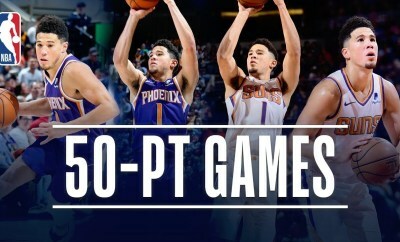 Devin Booker (22 years, 148 days) became the youngest player in NBA history to record consecutive 50-point games (59 on Monday, 50 tonight) as he finished with 50 points (19-29 FG) and 10 rebounds in a 124-121 Suns loss to the Wizards tonight in Phoenix. Prior to Booker, Rick Barry (50 points on 2/14/1967 and 52 points on 2/16/1967) was the youngest to do so at 22 years, 325 days of age. Jabari Parker led the Wizards with a season-high tying 28 points (9-16 FG) and a career-high 15 rebounds, while Bradley Beal added 28 points (11-22 FG) and 4 assists of his own in the victory. With the win, the Wizards improve to 31-45, while the Suns fall to 17-59 on the season.